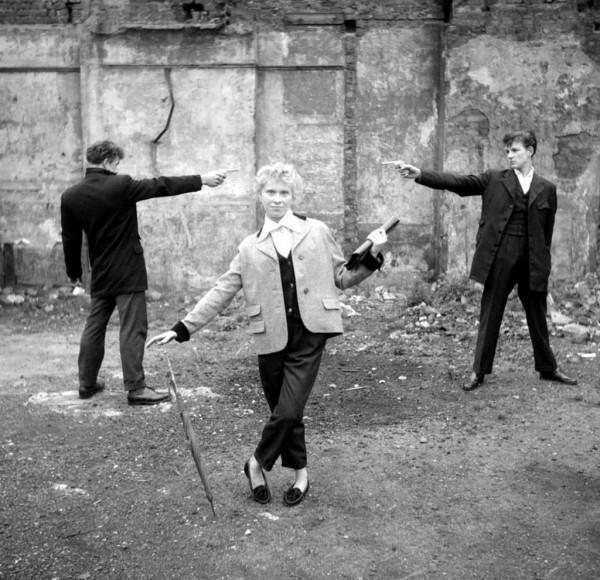 Adore these supremely cinemagraphic photos of Teddy girls by photographer and film director Ken Russell. 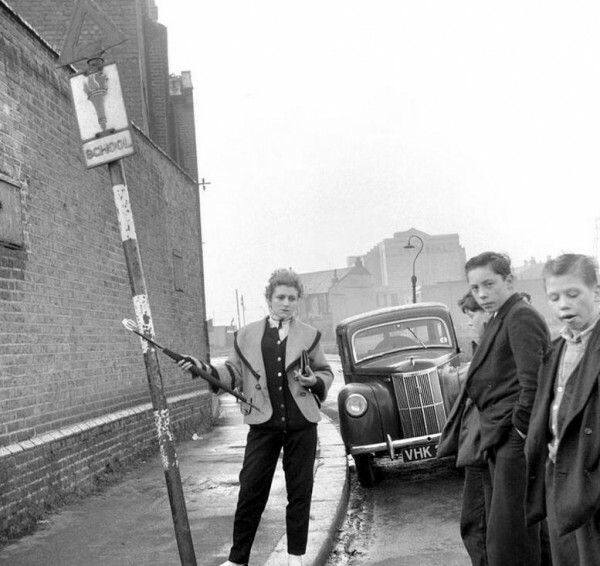 Before he went on to direct epic classics like Girls in Love and Tommy, Russell made an excellent little career as a documentary photographer, capturing youth culture for British news. 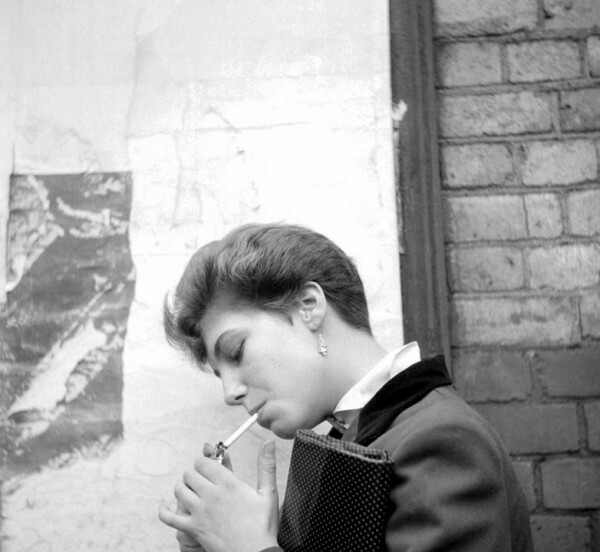 These photos are probably some of his best known from his days as a freelance photographer in 1955. So who are these children? 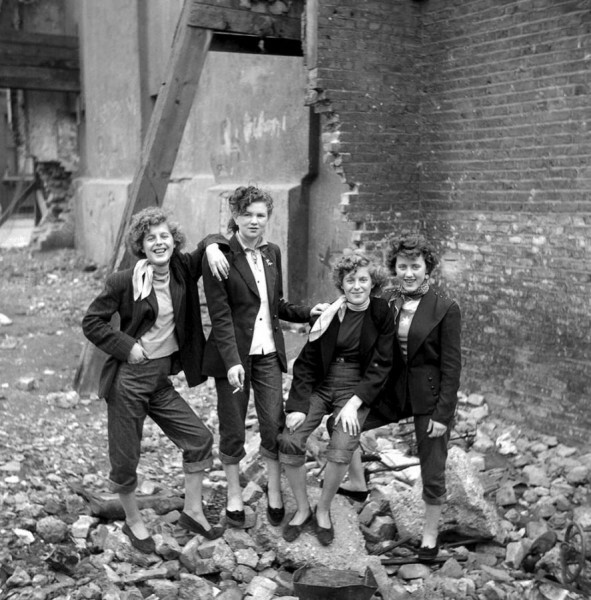 Teddy Girls of course emerged from the Teddy Boy look, which developed out of working-class London kids who combined Edwardian dress with American Rockibilly sensibility. 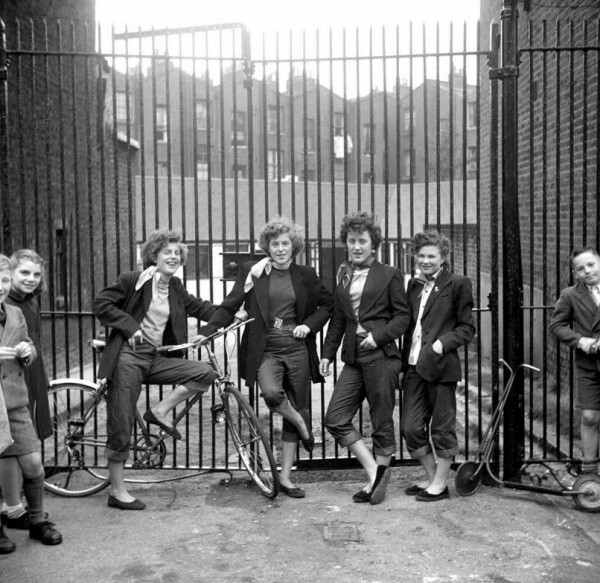 The 1950's marked a short period of post-war economic downturn in England, which we are reminded of as we look at these kids hanging out in dilapidated. bomb-ravaged plots. Adopting Edwardian dress was a way of acknowledging and remembering the opulent culture of Savile Row from the generation who came before them. 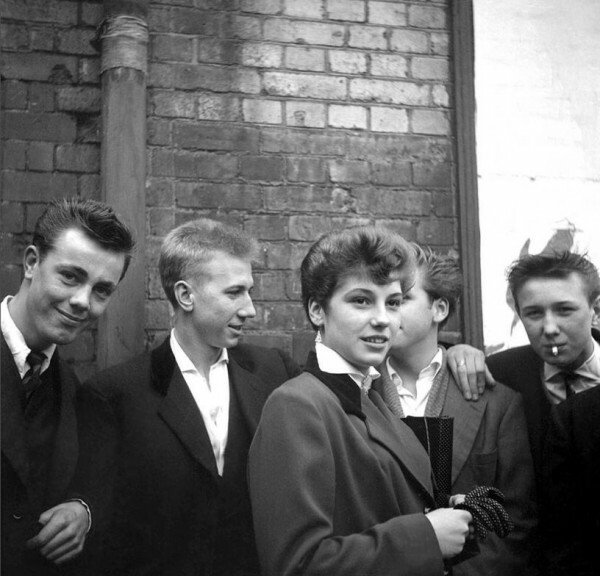 By the 50's the former Savile residents had discarded their velvet-lapelled jackets and brocade waistcoats, and the Teddy Boys scooped their look up but added brothel creepers and jellyroll-styled hair for a sort of dandy-rockabilly situation. 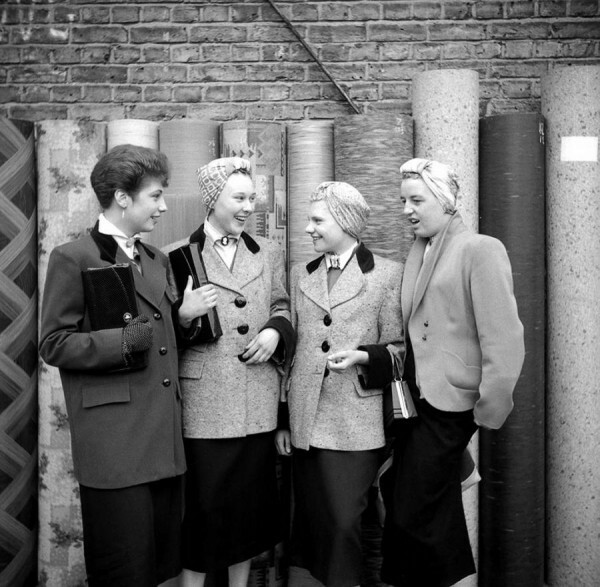 The boys started the look, but I really love the Teddy Girls, who took on the same styling principles, but added super feminine and delicate accessories to their suits. 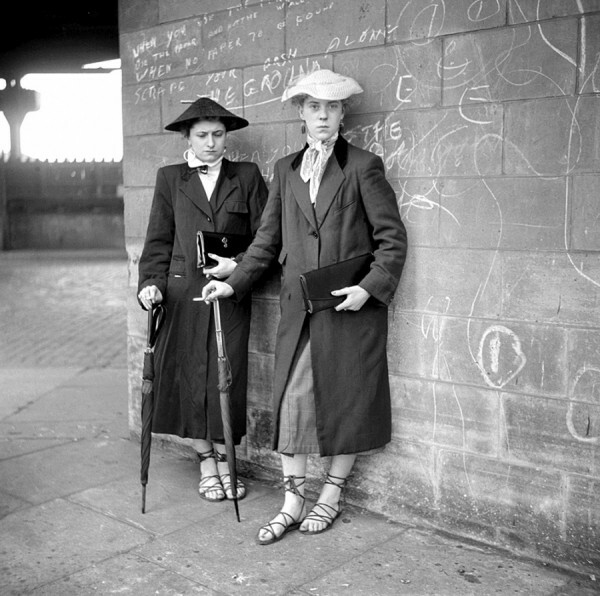 It wasn't so much about looking like the boys, but more about channeling their sense of rebellion with the poise of an Edwardian gentlewoman. They wore their collars high with string bowties, carried clutch bags, opted for slim-fitted skirts and tied scarves around their necks. Ballet flats and lacey sandals were the perfect shoes for treading lightly around London, but they also rocked utilitarian jeans. 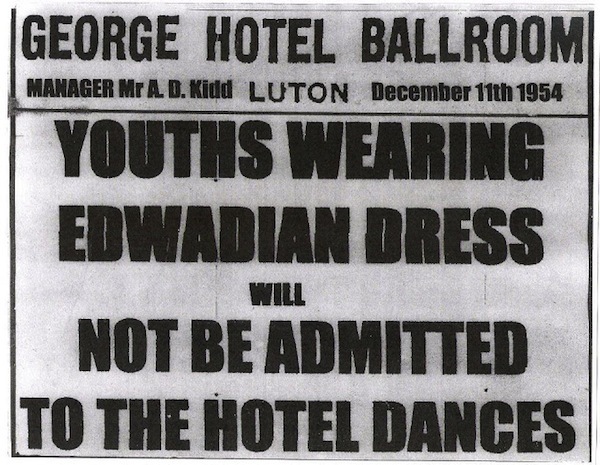 The contrast between gentle, wannabe opulence and rock culture wasn't always viewed as a delightful departure from England's dwindling 50's economy, but the eccentricity served a purpose. 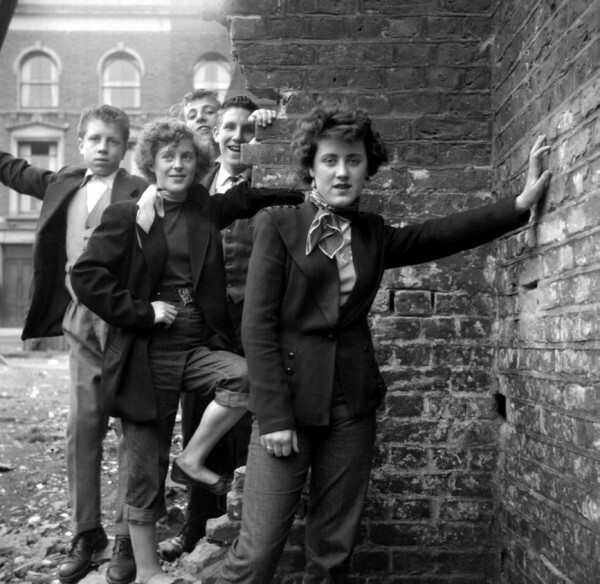 Of course, Teddy kids were known for breaking out into massive fights, looting, and gang-on-gang violence, but in their effort of sociopolitical rebellion, they (arguably) created the first youth culture movement of 20th-century London. Plus, if it weren't for them, we wouldn't of had The Beatles in all their adorable teenage glory. So inspiring. Love the attitude shown in their stances. Amazing. These photos are absolutely amazing. You can feel the vibrancy of youth that comes through the photos! I find it genuinely fascinating that you have explored the style of a subculture that is massively linked with right wing extremism and a lasting culture of racial riots in England. I live near London myself and studied modern British history. 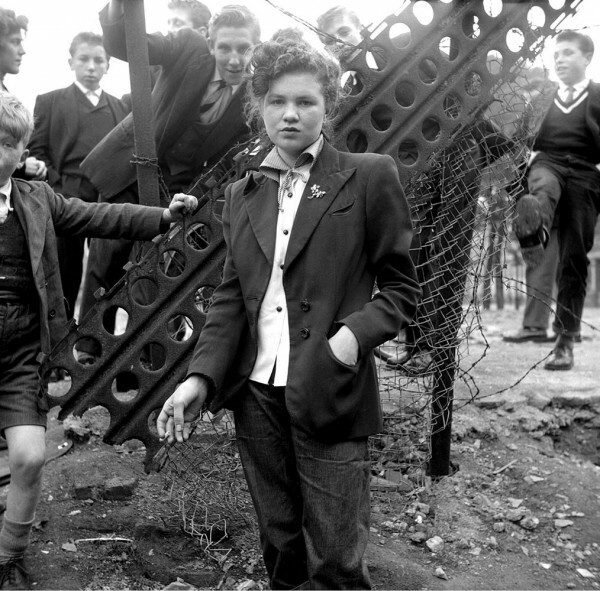 Part of my course focused on youth subculture. 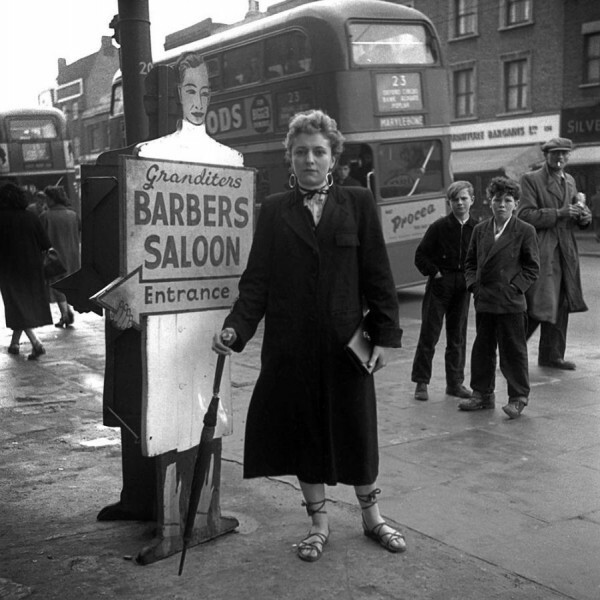 The Teddy Boys as you touched upon here were synonymous with the race riots in Notting Hill in the 50s and the intimidation of immigrants. Although of course not everyone who dressed in this way was a racist or had hostility towards immigrants . All in all a really interesting blog post, it has thrown up a lot of interesting questions to myself such as can fashion be disentangled with the character of the people wearing it? I suppose societies answer is yes, after all look how successful Hugo Boss -designer of the Nazi uniforms- has been. So thank you for such a thought provoking post-more please!